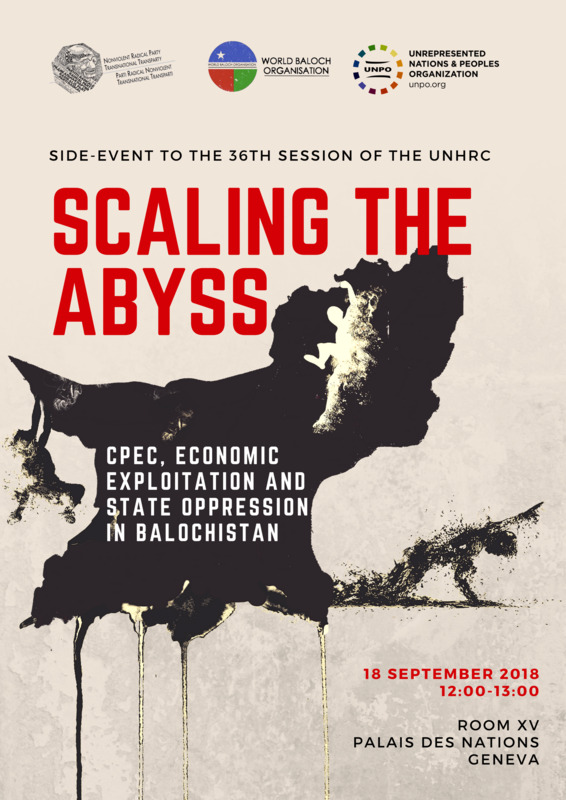 On the occasion of the 36th Regular Session of the United Nations Human Rights Council (HRC), the Nonviolent Radical Party, Transnational and Transparty (NPRTT) in cooperation with the Unrepresented Nations and Peoples Organization (UNPO) and the World Baloch Organisation will be organizing a side-event entitled “Scaling the Abyss: CPEC, Economic Exploitation and State Oppression in Balochistan”. A vast majority of the world’s marginalised and unrepresented communities paradoxically find that despite living in resource-rich regions they face extreme poverty, conflict, hunger and instability due to the systemic looting and plundering of their natural wealth by the general administration or multinational corporations. Balochistan, a region that spans across parts of Iran, Afghanistan and is currently Pakistan’s largest and most resource rich yet least developed region is a prime example of this unlawful practice. For centuries Punjabi and Chinese businessmen have been exploiting Balochistan’s plentiful minerals such as copper, uranium, gold, coal, silver and platinum. These projects have systematically excluded the Baloch indigenous peoples, not only depriving them of the employment and development prospects but also forcefully clearing them to make way for the construction sites. The 1995 multi-billion copper-gold Saindak project, the 2002 Gwadar port project and many other projects which the Pakistani administration have been pushing through, with substantial financial aid from Chinese businessmen have been displacing and marginalising Baloch people. Consequently, Balochistan is Pakistan’s poorest region, with the highest rates of unemployment, lowest life expectancy and extremely scarce access to electricity. In fact, Balochistan is responsible for about 23% of Pakistan’s total gas production and astonishingly, only 6% of the gas produced is actually consumed in the region itself, while the rest is consumed in other parts of Pakistan. The more recent introduction of the US$46 billion China-Pakistan Economic Corridor (CPEC), which through a combination of transport and energy projects will connect Gwadar to China’s Kashgar – home to the oppressed Uyghurs – has only amplified the rampant exploitation of the region. The complete exclusion of any Baloch representative from the decision-making process, despite the crucial geo-strategic position of Balochistan to the project, sheds light on the persistent omission of the Baloch people in the larger Pakistani administrative framework, systematically denying them the opportunity to participate in their own economy. As construction has commenced its implementation has been ruthless, with local inhabitants forcefully cleared and any dissenting voice brutally silenced. Moreover, the massive influx of Punjab and Chinese labourers for the project is threatening to destabilise the already fragile demography in the region, consequently making the Baloch a minority in their ancestral lands. Alongside this wide-spanning economic exploitation of the region, the Baloch suffer at the hands of the Pakistani authorities, incessantly subjected to enforced disappearances, arbitrary detentions and extrajudicial killings – all part of a larger framework of the marginalisation and oppression of the Baloch people. At a time when independent media and international civil society organisations are repeatedly being denied access to the region, the side-event will contribute to filling the existing information black hole on human rights violations in Balochistan and to draw international attention to these heinous crimes. Building on a series of events organised by UNPO at the Human Rights Council on the plight of Balochistan, academic experts and renowned human rights advocates will discuss the challenges and interests at stake, looking at how the international community can support the Baloch people to end atrocities committed against them.